Door Hangers is rated 4.9 out of 5 by 25. Make your custom door hangers fit your vision perfectly. "By working with PrintPlace, we were able to cut costs by over 40% compared to our previous door hangers printer/supplier. We can honestly say that the entire process from start-to-finish has been stress-free and we are already planning on putting in another order next month." Rated 5 out of 5 by cowgirlannie from Just what we needed! Quick, easy and always printed right the first time. Rated 5 out of 5 by Lucero from Great quality Am happy, quality, faster and great customer services online. Am exploring what is my new order. Rated 5 out of 5 by Gaye T from Door hangers I ordered door hangers and the quality was excellent. The printing was beautiful and it was glossy and cut well. Rated 5 out of 5 by jane_db from Great Quality Quality at a great price, with very good service. I will use them again for future projects. Door hangers printed by PrintPlace.com are a simple, direct and effective way to advertise your business or organization. Customize them with your own artwork, and options like coupon perforating, to make them uniquely yours. 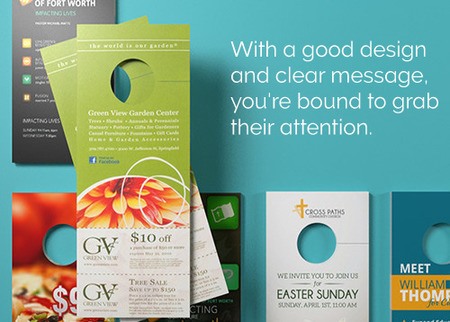 They will grab your customers' attention and connect with them as you bring your message into their homes. We have a wide range of door hanger sizes available. You can print them on thick 16 pt. cardstock with matte, gloss, or high-gloss UV coating. Whatever you choose, you’ll get professional results at the best price. And a beautiful printed product every time. Need you door hangers fast? We have a same-day printing option for those who are in a hurry. Call us to discuss additional options for custom door hangers or fill out our custom order form online. Before printing your door hangers, use our layout templates to check whether your artwork is laid out correctly. Find the size of your custom door hangers below. Then simply place your artwork on one of our layout templates. You’ll be able to easily verify the correct dimensions for full bleed and die cutting the doorknob hole. Don’t forget to check that your text is safely inside the caution zone too. Door hanger advertising makes certain your target customers see your ad because it is hung right on their front door. Restaurant and real estate door hangers are especially effective since they touch people just at the right moment: typically as they are getting home from work. A couple things you can do to help your campaign get the best possible results are: maximize your impact by printing on both sides of the paper, and add a tear-off coupon to encourage engagement. PrintPlace goes beyond basic door hanger printing by always using high-quality presses, sturdy cover stocks, and with strict color consistency to advertise your business at its best.